Discover the joy of learning and friendship with this season’s most heavenly new collection! From executive producer Roma Downey (“Touched by an Angel”) comes the first three volumes of a fresh, fun and inspiring educational series that children and their parents (and grandparents too) can enjoy together in LITTLE ANGELS ABC’s, LITTLE ANGELS ANIMALS, and LITTLE ANGELS 1,2,3’s, now available on DVD with Digital Copy from Twentieth Century Fox Home Entertainment. 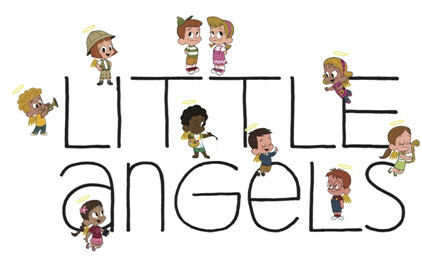 LITTLE ANGELS is an animated DVD series and has been created for pre-school aged children to teach practical learning skills like ABCs and numbers. The series is presented in a captivating and entertaining format that will help parents to teach their little angels a big love of learning while also providing hours of fun to enjoy together with exciting DVD extras. Pre-school twins Alex and Zoe are blessed to have eight Little Angels watching over them – literally! These Little Angels live on the ceiling of their bedroom, painted there so they are the first things the kids see when they wake up in the morning and the last thing they see before they fall asleep at night. The angels come to life when the children need them most, helping guide them through the challenges of their young lives. Featuring a great deal of interactive DVD extras including charming music videos and downloadable activity sheets, plus a downloadable bonus digital copy of each lesson that will allow for learning on the go, the LITTLEANGELS ABC’s, LITTLE ANGELS ANIMALS, and LITTLE ANGELS 1, 2, 3’s DVDs are a great value moms can feel good about sharing with their little angels. I got a chance to review Little Angels ABC’s, Little Angels ANIMALS, and Little Angels 1,2,3’s all on DVD and Digital copy. This was our first time hearing about the Little Angels series and I have to say the kids really enjoyed watching them. I loved the fact that each movie teaches lessons for young kids to understand and that each DVD also comes with printable activity sheets that the kids can do, which was great. That bonus feature helped the kids learn a bit more about the lesson from each movie This was perfect for both my little ones, but especially my four year old. I think the best thing for him were the sing-a-longs. Looking for some great Easter Cards? I have a free printable from Fox that your kids can handout to their friends right before the Easter Bunny pops over for a visit. Disclosure: All opinions are my own. I received Little Angels DVDs at no cost for the purpose of this review. No other compensation was received.